“Rob Cottingham’s skillful visual capture of my session at a recent conference was incredible.” Beth Kanter Looking for a whole new way to make your next tech or business event fun and memorable? Then ask about hiring Rob for cartoon-blogging: live, on-the-scene visual notes from keynotes, presentations and panels. 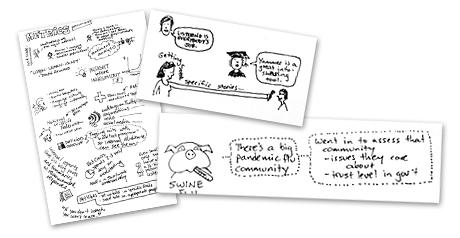 Ranging from quick sketches to full… Continue reading Cartoon your event!